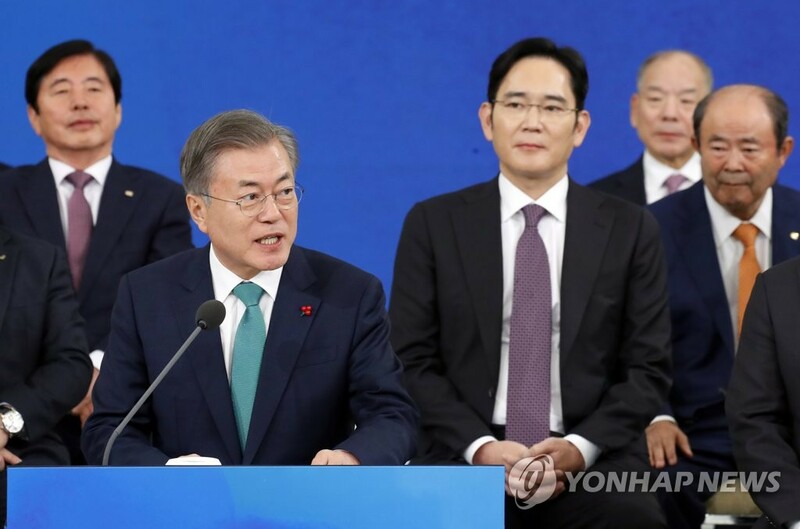 Lee, the vice chairman of Samsung Electronics, vowed to expand the company’s investment in technology and infrastructure. Hyundai Motor Group vice chairman Chung Eui-sun said the business group will focus on developing electric and hydrogen-powered vehicles, and Hwang Chang-gyu, the CEO of South Korea’s top fixed-line operator, KT Corp., called for deregulation in areas related to privacy protection. The presidential office earlier said the government plans to publish a book with all the questions and suggestions presented at Tuesday’s meeting, along with responses from related government offices. 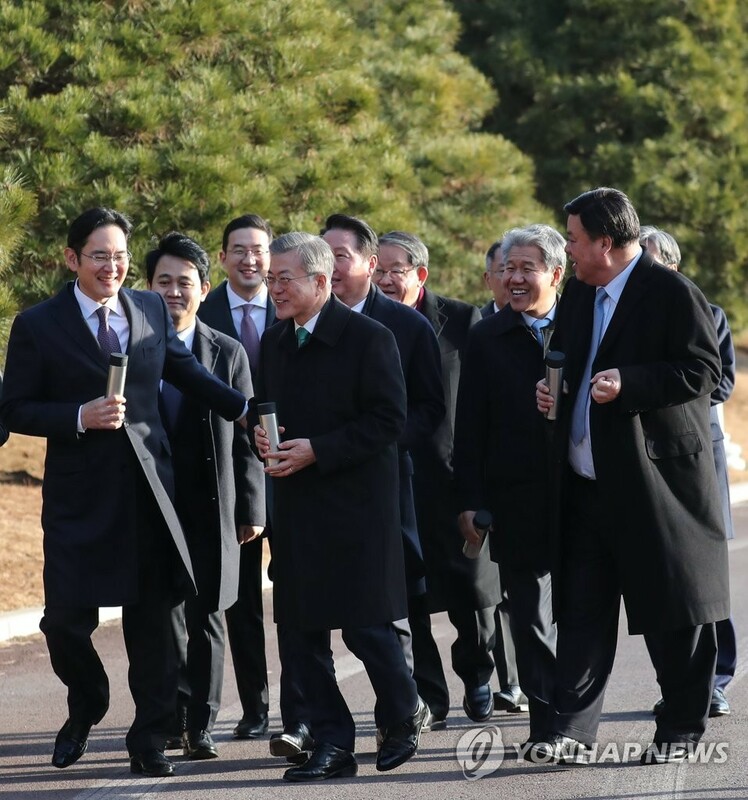 After the indoor session, Moon had a stroll around the presidential compound with leaders of major business groups, during which he told Hyundai Group Chairwoman Hyun Jeong-eun that things will “work out well,” apparently referring to the company’s inter-Korean projects. 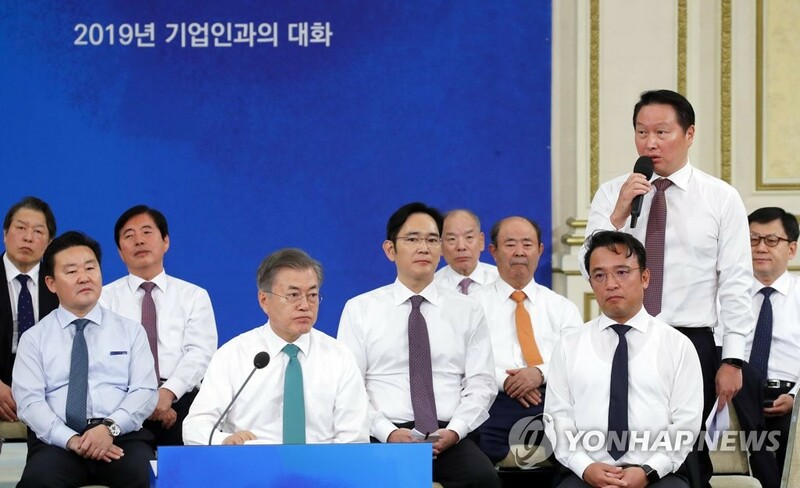 Hyundai Group is a key operator of the now-suspended tour program to Mount Kumgang on North Korea’s east coast, as well as a developer of the Koreas’ now-shuttered joint industrial park in the North’s border town of Kaesong.